"Cherubim and a Flaming Sword" by J. Kirk Richards. Nephi’s vision of the Tree of Life (1 Nephi 11-15) contains imagery that ties into the description in Genesis/Moses of ‘a flaming sword…[keeping] the way to the tree of life’, but only after correcting for an apparent typographical error in the current editions of the Book of Mormon. Note that this differs from our current edition of the Book of Mormon, which reads “word” instead of “sword”.2 This passage describes that which divides the wicked in the ‘great and spacious building’ from the Tree of Life, namely, ‘the sword of the justice of the eternal God’. 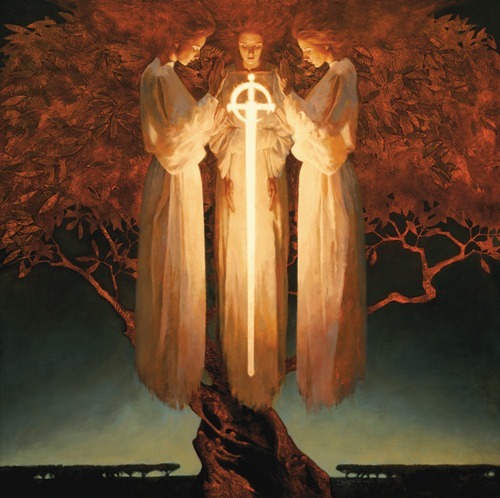 Combining Nephi’s descriptions of his (and Lehi’s) vision of the Tree of Life, we have ‘the justice of God’ represented as both a sword and a flaming fire — combined, a flaming sword — and in both cases keeping the Tree of Life from those who choose the world (the ‘great and spacious building’) instead of coming to the Tree of Life on God’s terms. What is perhaps more interesting is that we get through this vision an interpretation of the ‘flaming sword’ mentioned in Genesis — the justice of God, which prevents us in our willful state from approaching the Tree of Life. What the rest of Nephi’s vision tells us is that it is the love and condescension of God that gives us a path (‘strait and narrow’) and a guide (‘a rod of iron’)4 by which we can come and partake of the Tree of Life and thus enter back into God’s presence. ..bruce..
1 Analysis of Textual Variants of the Book of Mormon: Part One (Title Page, Witness Statements, 1 Nephi 1 – 2 Nephi 10), Royal Skousen (FARMS/BYU, 2004), pp. 257-258. 2 On the other hand, see “The Word of God” by Leslie Taylor, Journal of Book of Mormon Studies, Vol. 12, No. 1 (2003), pp. 52-63, for an indication that the differences between ‘sword of God’ and ‘word of God’ as used in the scriptures may not be all that great. 3 See “Garden of Eden: Prototype Sanctuary” by Donald W. Parry, Temples of the Ancient World, edited by Donald W. Parry (Deseret Book/FARM, 1994), esp. p. 129 and pp. 134-135. 4 But see Skousen (above), pp. 174-181, who argues that this should be “straight and narrow”.